Particle agglomeration is an important processing step in the food, chemical, and mineral industries, where it plays a key role in de-dusting, particle size control, density control and the performance of bulk solid products. 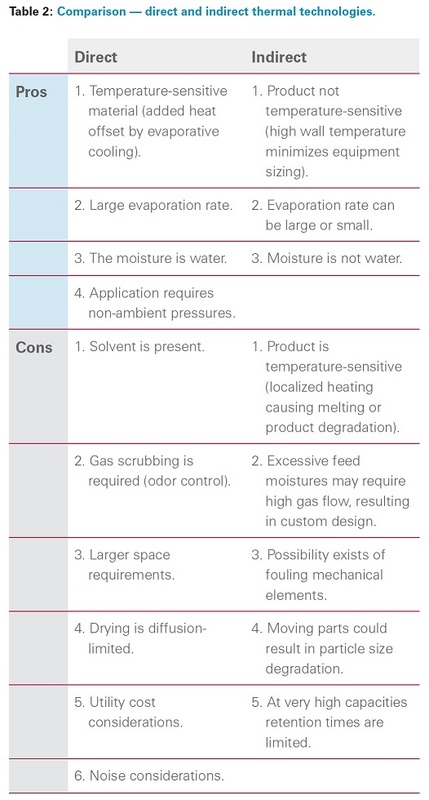 Drying systems play an equally important role in various parts of the agglomerating process: selecting the right drying system can have a significant impact on investment and processing costs, finished product quality, and the product’s ultimate performance in a given application. 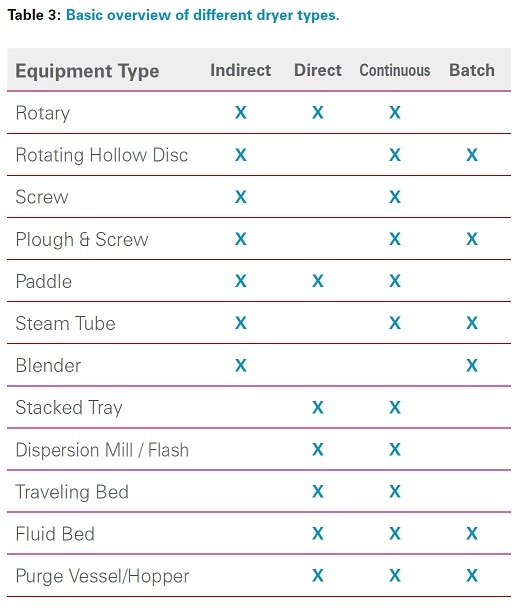 Selecting the right drying process requires a thorough evaluation of the many available technologies, often with the help of a trusted and experienced equipment supplier. Whether used earlier or later in the agglomeration process, drying involves the removal of unwanted volatile compounds from a material. Examples of bulk solid materials include chemical salts, foodstuffs or feed components, polymers or mineral products, and any number of byproducts. The volatile component could be water, solvents, or other type of liquid medium. For our purposes, we will define drying as a separation process in which the liquid portion of a mixture of solids and liquids is removed by non-mechanical means. This generally requires heating the mixture to volatilize or evaporate the liquid. When heat is applied to a material to be dried, the rate at which the volatile component is removed can vary depending on a number of factors. A lot can be learned by simply bench-testing the material. The rate at which the material loses its moisture can be determined in one of these tests. This test results in a drying curve (Figure 1). 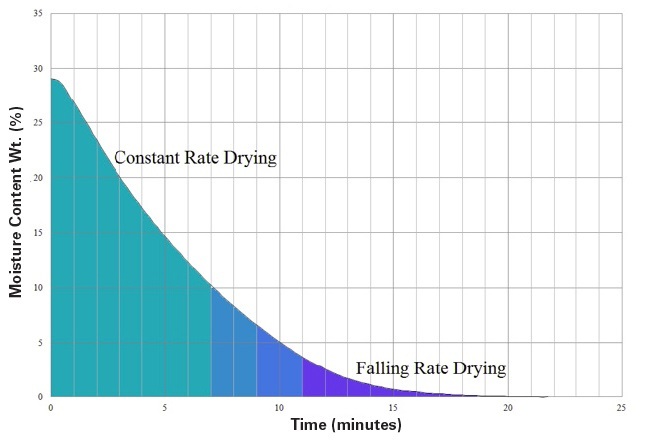 Combining the drying curve data with general physical information about the material will often lead to a good estimate of which dryer system to consider. As a first step, it is important to determine whether the volatile material is being removed at a constant or falling rate. During constant-rate drying, the thermal energy input results in evaporation that takes place either at or just below the surface of the particle, removing what is commonly called “free moisture.” This rate of evaporation is primarily controlled by the rate of heat transfer from the energy source to the material. As such, the material being dried will have a constant product temperature consistent with constant thermal energy input. In falling-rate drying, the thermal energy input to evaporate the liquid decreases as the surface moisture is removed, and instead goes into increasing the heat in the remaining solids that may have entrapped or bound volatiles. At this point the drying is now typically limited by diffusion. That is, the drying rate is proportional to the rate of diffusion of trapped moisture to the particle surface. As such, the drying rate is affected by the vapor concentration surrounding the particles, the porosity residence time, the particle temperature and the particle size. There are three primary methods of heating materials: direct (convective) heating, indirect (conductive) heating, and radiant heating (Figure 2). In convective (or direct) drying, the heat is transferred through direct contact between the heat transfer medium (usually a gas such as air or nitrogen) and the material. In conductive (or indirect) drying, the heat is transferred to the material indirectly through contact with a heated surface. In this way, the material is separated from the heat transfer medium by a wall, usually steel, and the heat is conducted through the material. In conductive drying processes, the heat transfer medium is typically steam or hot oil, but other examples include water, glycol solutions, electrical resistance or molten salts. In radiant drying, heat is transferred via radiation from an external energy source with no physical contact between the energy source and the material being heated. A crude form of this is solar or sun drying. Industrial processes use radiation sources such as microwaves or UV waves. Although radiant-type drying systems find success in some specialized applications, agglomeration systems most often benefit from either direct or indirect dryers. Therefore, we will concentrate on these two technologies. Depending on the materials involved, each method offers advantages and disadvantages. While more than one drying process solution for your application may exist, it is important to consider both the required capital investment and operational expenditures before deciding on a path forward. Along with this, the impact of the dryer on the final agglomerated product is key. What might seem like the lowest cost from the standpoint of initial capital investment could end up costing more in operating costs over the life of the dryer or through lost or off-spec product production. In terms of system setup and operation, there are many differences between indirect dryers and direct dryers. The amount of ancillary equipment, dryer design, overall system footprint, utility costs and capital costs can differ widely. Since the interaction between different dryer types and the agglomerated material will vary, it is important to take all of this into account when selecting a dryer. As previously stated, direct drying involves direct contact between the product and the heat transfer medium. In most cases, the heat transfer medium is air. Since any continuous dryer will have a wet product inlet and a dry product outlet, an efficient natural tendency is to use the heat transfer medium as the means to convey the product between the dryer inlet and outlet. In its most basic form, a so-called flash dryer mixes hot air with wet product while conveying. Variations of this are dryers that incorporate a dispersion unit in the hot air stream to better mix the wet solids and hot air. The dispersion unit could be a simple paddle mixer or a high intensity mill. Other examples of direct dryers are rotary dryers, fluid bed dryers, belt dryers, tray dryers, and spray dryers. Each type has a unique design and operation, and all have been used in aggregation processes. Direct dryers have additional benefits that derive naturally from their design. For example, if the volatile liquid to be removed is water, direct drying equipment could be economical to procure. This is especially true when drying a powder or fine granules. In addition, if the solid material is heat sensitive, evaporative cooling that effectively transfers heat from the particle to the liquid being carried off helps protect the material from overheating. 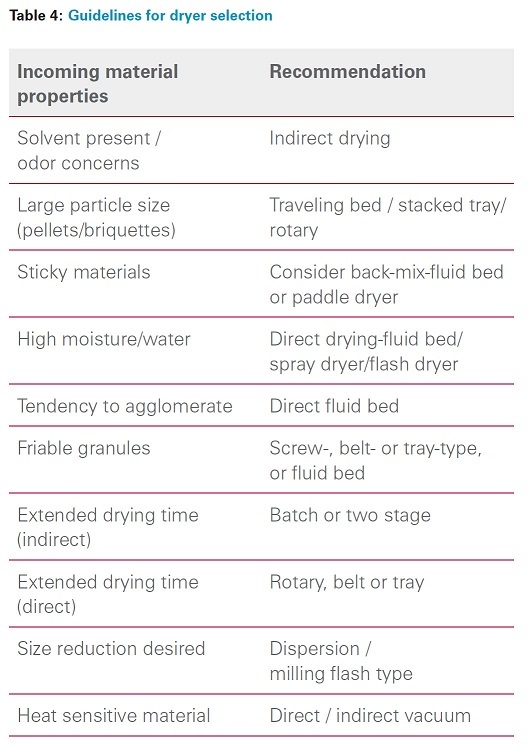 If the product has a sticky phase between the “wet” and “dry” phase, most direct dryer designs perform well. For example, in the fluid bed design there is internal material back-mixing that naturally occurs between the partially dried product and the fresh wet feed that helps to push past this sticky phase. Spray dryers will flash off the surface volatiles relatively quickly and almost instantaneously move through the sticky phase. Most solid materials will have a heat capacity of 0.1 to 0.4 Btu/(lb°F) while that of most liquids ranges from 0.4 to 1.2 Btu/(lb°F). Water has a specific heat value of 1.0. In drying applications, most of the thermal energy is consumed in the liquid-to-gaseous phase transition of the volatile where the latent heat of evaporation can range from 100 to 1000 Btu/(lb°F). Air, on the other hand, typically has a constant pressure heat capacity somewhere around 0.24 Btu/(lb°F). This means that most direct drying applications will typically require a much higher rate of heated airflow than the combined rate of solids plus liquids in the feed material. Due to the required high rate of airflow, the process will need one or more fans pulling air from the surrounding environment. This air must be heated, either directly with a burner or through heat exchangers. The cost of a direct dryer is usually, but not always, less than that of an indirect dryer. However, the total cost of the dryer plus ancillary equipment needed to run the process should always be part of the analysis. In addition to the total equipment acquisition costs, it is also important to consider the system’s operating cost over the life of the process. Utility energy costs for a direct dryer system with high airflows are typically higher than those of an indirect dryer. When compared to an indirect drying system, a direct drying system typically has a larger footprint, which adds to overall installation costs. If the exhaust gasses can be directly vented to the atmosphere, direct drying is always a viable choice. However, if the exhaust gases require treatment for odor or pollution control, a direct dryer with its higher airflow will result in a larger and more costly system. Depending on the properties of the materials involved, this could weigh heavily against a direct drying option. 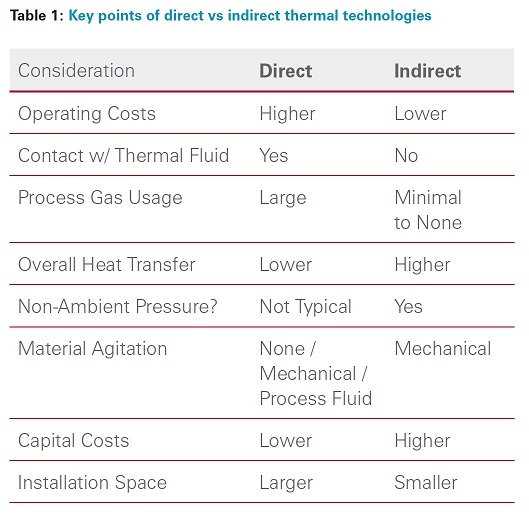 In general, indirect dryers typically have higher thermal efficiencies than direct dryers because the heat transfer fluids in indirect systems are also typically operated in a closed loop (for example, boiler or hot oil heater systems). The total surface area is smaller, resulting in lower heat losses to the atmosphere. Direct drying systems will often employ a heat exchanger prior to the air inlet heater that uses recycled exhaust heat to preheat the air going into the system. However, even with this, the thermal efficiency of a direct dryer will still not approach that achievable in an indirect dryer. While most indirect dryers have heated bodies, the mechanical agitation and conveyance is provided by a variety of rotor styles that can be chosen to match the application. For example, hollow parallel disc rotors allow the dryer to operate practically full and yields a high amount of heat transfer surface in a compact design. Hollow screws not only transfer heat but convey the material. High-speed paddles or ploughs will force material against the heated shell and are better suited for sticky materials when compared to a disc or screw-type rotor design. Mechanical agitators will sometimes input small amounts of additional energy into the product, thus decreasing the thermal load for drying (and inversely requiring additional cooling for cooling applications). Nearly all indirect technologies can operate in continuous or batch modes. Indirect dryers may or may not have an effect on the particle size distribution of the product being processed, but this is an important consideration for agglomerated products. Paddles, plows, hammers, ribbons, etc., are typically designed to only impart enough force to keep the material moving past the heat transfer surface. While the environment might be too aggressive for curing of green agglomerates, these devices have been used for cooling. Except in zones of great acceleration with abrasive material, wear is minimized on the parts in an internal indirect dryer, resulting in lower maintenance costs. Just as there are many options for agglomeration there are many types of dryers to go along with them. It is important to evaluate the process requirements as a whole and to avoid the temptation of dividing the project into two parts (drying and agglomeration). Designing as a whole creates the most efficient system. Most often the dryer type in an agglomeration system will be a direct type because water is the liquid to be removed. Indirect dryers are preferred when any solvent is present. Consider all variables in the process: volatile content and type, wet material and dry material consistency and properties most important in the end product. Define ambient conditions and footprint requirement and include these parameters in the overall system design. Different dryers can sometimes be made to work, but it is important to consider the characteristics of the feed material and the product requirements when selecting a dryer. Even if a dryer is already on-site or available, it may not provide the best long-term process solution. In defining a process, the end results can be reached much more quickly by dealing with suppliers that are skilled in both dryer and agglomerator designs. John Heapy is thermal products application engineer and Michael White is director of technology, Bepex International LLC. Bepex serves the global food, chemical, and polymer markets by providing process development services and custom-designed industrial scale process systems and equipment. For more information, visit www.bepex.com.